Ask your child who their favorite author is. Go to the library and check out everything you can by that author. Visit the author’s website and see if they have an address listed. Write a letter to the author with your child and mail it! 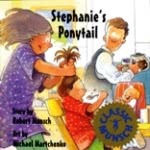 Robert Munsch might be your new favorite author! Many of his books are available on Tumblebooks! Try Stephanie's Ponytail.